Problem: Focusing 90% of your effort on the website’s design. Once upon a time there was a beautiful website. A website so beautiful that visitors' eyes would literally pop out of their sockets when they landed on it. You know…the kind of website where it’s love at first sight. "Your website is the fairest of them all, but is it bringing in sales?" The website designer was furious. She had spent days belaboring over fonts, colors and parallax effects. She had spent hours creating beautiful and interesting buttons, styled with gradients, shadows, and borders. How dare the Internet actually question if her website was making money! But deep down she knew the Internet was right. Clients were not magically booking her services, even though she had the most beautiful website of them all. With wild jealousy, she began plotting to get rid of all the other websites on the internet. Before she had a chance to execute her plan, the Internet decided that being pretty, but with nothing to say, was not enough. The Web Designer's website was forever banished into cyberspace - a mysterious, dangerous and isolated web that operates outside the public's awareness. The moral of the story? She who has the prettiest website does not always win. 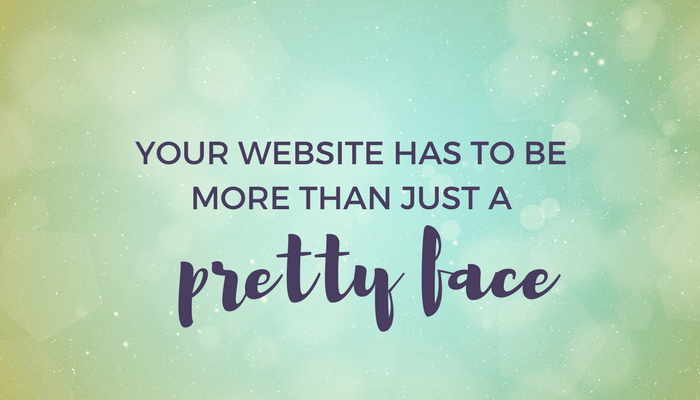 Your website has to be more than just another pretty face taking up space on the internet. Secret #1 - Pretty is not the deciding factor. I am going to let you in on a little secret - it’s not just good looks. A great-looking website alone is not going to bring you success. So many 'pretty' websites fail to deliver any kind of results. In fact about 80% of websites online today fail to generate a return on investment (ROI) for clients. Secret #2 - Great design, alone, is not the be-all end-all. Yes, web design is important. But should it be top priority? Should it take up all of your time? The answer is NO! Here’s why. The look of your website isn't going to be the deciding factor on whether or not someone will hire you. There's usability -- how easy is your site to use? There's your site's written content -- how are you speaking to your ideal clients? There's trust -- how well is your audience getting to know you so they can trust that hiring you would be a wise decision? All of these things are more important than the aesthetics of your website. So before you waste tons of time getting your site looking absolutely perfect, make sure it's functioning properly for you. Then you can look into making it look its absolute best. Secret #3 - Function first. Function should drive your website design. Without perfect clarity on your primary call to action, how will you know what element on the page needs to draw the eye? Without knowing who your best fit client is, how will you know which images will connect with website visitors? Without determining your website goals, how will you provide visitors with the right guidance to direct them to where you want them to go on your site? If you don’t know what a website visitor needs to accomplish on your website, how can you design the layout of your website? Your website will be successful if the people who visit can quickly and easily find the information they need to buy your products or services. Helping them do that is what should drive your decisions about design. Secret #4 - Being pretty is not enough. Am I saying don't worry about the aesthetics of your website? Absolutely not. A website that looks great is important because it will allow your business to make a great first impression. It will help establish you as a professional. But you can’t rely on that alone to book clients or sell your products. Your site needs to be easy to use, convincing, and trustworthy. And all of those things don’t come from aesthetics alone. Unlike a stunning portrait hanging in an art gallery, a website has to be more than just a pretty face.